Have you ever been in a situation where you have to buy a gift for someone? The important aspects you consider are the budget of the gift and sources of fund required to fulfil that budget. Similarly, with managing a business, funds are extremely important for any business to sustain. Let us learn the sources of funds. Business simply cannot function without money, and the money required to make a business function is known as business funds. Throughout the life of business, money is required continuously. Sources of funds are used in activities of the business. They are classified based on time period, ownership and control, and their source of generation. Learn more about Sources of Financing Business here. Read more about Equity Shares and Preference Shares here. Long-term sources fulfil the financial requirements of a business for a period more than 5 years. It includes various other sources such as shares and debentures, long-term borrowings and loans from financial institutions. Such financing is generally required for the procurement of fixed assets such as plant, equipment, machinery etc. Medium-term sources are the sources where the funds are required for a period of more than one year but less than five years. The sources of the medium term include borrowings from commercial banks, public deposits, lease financing and loans from financial institutions. Short-term sources: Funds which are required for a period not exceeding one year are called short-term sources. Trade credit, loans from commercial banks and commercial papers are the examples of the sources that provide funds for short duration. Short-term financing is very common for the financing of present assets such as inventories and account receivables. Seasonal businesses that must build inventories in terms of future prospects of selling requirements often need short-term financing for the interim period between seasons. Wholesalers and manufacturers with a major portion of their assets used in inventories or receivables also require a large number of funds for a short period. Learn more about International Financing and Choice of Sources of Funds here in detail. 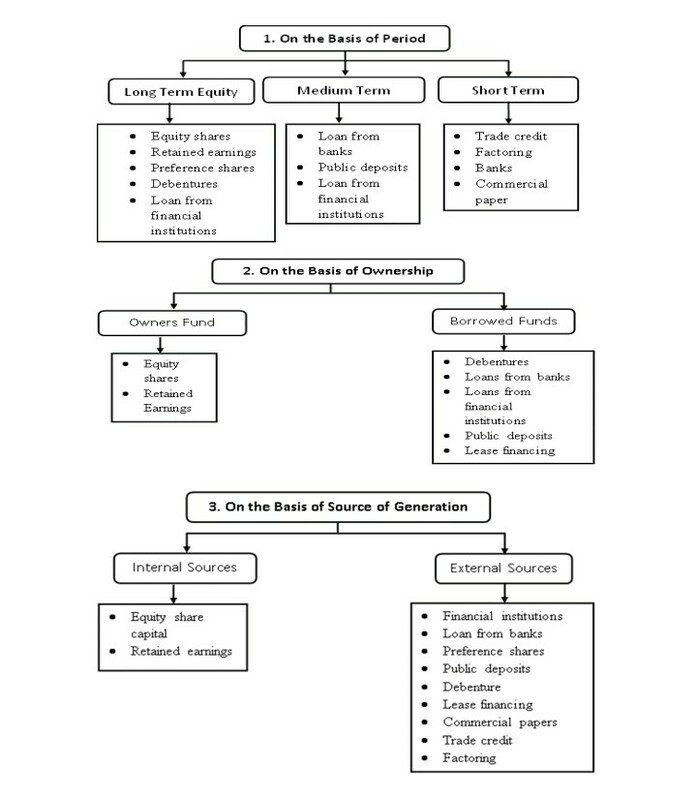 On the basis of ownership, the sources can be classified into Owner’s funds and Borrowed funds. Owner’s funds mean funds which are procured by the owners of a business, which may be a sole entrepreneur or partners or shareholders of a business. It also includes profits which are reinvested in the business. The owner’s capital remains invested in the business for a longer duration and is not required to be refunded during the life period of the business. This capital forms the base on which owners gain their right of control of management in the business. Some entrepreneurs may not like to dilute their ownership rights in the business and others may believe in sharing the risk. Equity shares and retained earnings are the two important sources from where owner’s funds can be obtained. Borrowed funds refer to the funds raised with the help of loans or borrowings. This is the most common type of source of funds and is used the majority of the time. The sources for raising borrowed funds include loans from commercial banks, loans from financial institutions, issue of debentures, public deposits and trade credit. These sources provide funds for a specific period, on certain terms and conditions and have to repay the loan after the expiry of that period with interest. A fixed rate of interest is paid by the borrowers on such loans. Often it does put a lot of burden on the business as payment of interest is to be made even when the earnings are low or when the loss is incurred. These institutions don’t take into consideration the activities of business after the loan is given. Generally, borrowed funds are provided on the security of some assets of the borrower. The way of classifying the sources of funds is whether the funds are generated from within the organization or from external sources of the organization. Internal sources of funds are those that are generated inside the business. A business, for example, can generate funds internally by speeding collection of receivables, disposing of surplus inventories and increasing its profit. The internal sources of funds can fulfil only limited needs of the business. Whereas, External sources of funds are the sources that lie outside an organization, such as suppliers, lenders, and investors. When a large amount of money is needed to be raised, it is generally done through the external sources. External funds may be costly as compared to those raised through internal sources. In some cases, business is required to mortgage its assets as security while obtaining funds from external sources. The issue of debentures, borrowing from commercial banks and financial institutions and accepting public deposits are some of the examples of external sources of funds commonly used by business organizations. Read the Significance of Business Finance here. Q: How can a business generate funds internally? Answer: A business can generate funds internally by speeding collection of receivables, disposing of surplus inventories and increasing its profit.